From ancient times to the modern day, gold has always been synonymous with wealth and prosperity. Historically this precious commodity has been a store of liquid wealth and was frequently used for trading. 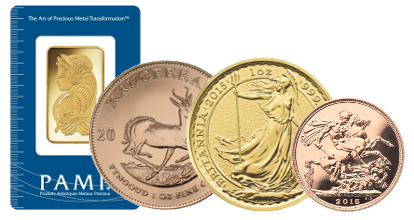 Although no longer circulated in the form of gold standard currency it remains an integral asset, from large central banks to smaller individual investors, many choose to store sizeable portions of their liquid assets in this scarce resource. Physical gold offers investors the opportunity to spread their investment risk through a well balanced portfolio by offering them a store of wealth outside of the banking system. Even though there is no gold standard, gold is still seen and used as the world’s universal currency, providing a stable and reliable alternative to printed fiat money. Since 2016, the price of gold has risen by 6% to 7% per ounce. The World Gold Council announced that 2018 saw the largest amount of Central Bank gold reserve purchases in 50 years, with an overall rise in gold demand of 4%. Global economic slowdown - caused by a combination of the US/China trade war, protectionist trade policies, and Brexit - has seen investor confidence slump, and many are concerned about one thing: recession. The UK has been particularly vulnerable in the past few years, with the uncertainty of Brexit playing on the minds of investors and businesses alike. Fears of a Hard Brexit without a withdrawal agreement have caused significant spikes in the gold price in GBP, with gold touching over £1,030 per ounce earlier this year. Even at its present £980 per ounce, gold's value in Sterling is 15% higher than it was three years ago, and last year the World Gold Council reported a 12% rise in demand for gold bullion in Britain. Time and time again, with stock market concerns and economic fragility, we see investors turn to safe haven assets like gold bullion; a sensible way of diversifying a portfolio to protect against risk. If central banks are so keen on physical gold, could you benefit from investing? Gold investment is an ideal method of accumulating and protecting wealth. Furthermore, it is also seen as an ideal method of diversifying an investment portfolio due to its negative correlation with stocks and bonds. Although the price of gold maybe volatile in the short-term, gold maintains its value over longer periods of time, providing a useful hedge against the value erosion of fiat currency. Additionally, if you are planning a substantial gold investment, choosing to buy British gold Sovereign or Britannia coins will exempt you from Capital Gains Tax (CGT). Gold is frequently referred to as the ‘crisis commodity’ due to its ability to hold value in both financial and geopolitical uncertainty. 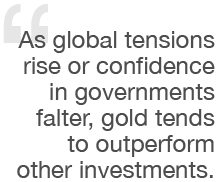 As global tensions rise or confidence in governments falter, gold tends to outperform other investments. To not hold gold is to fully trust the government on all levels, relying on them to be able to maintain the economy. With the US dollar technically very weak, global currency debasement is a concern for many, especially those not vested in gold. If a large currency debasement occurred, tangibles including gold will see substantial increases in value. Buying physical gold will allow you to hold assets outside of the banking system, this reduces personal exposure to banking related risks whilst also diversifying your wealth distribution. Unlike fiat currency, gold’s value is not determined by governments, fiat currencies hold no tangible value and their value is only backed by governmental laws. In the face of increasing geopolitical tension and an uncertain economic future in Europe and elsewhere, investors turned to gold last year. Investment demand increased by an enormous 70% in 2016 compared to 2015, its highest level since 2012. Meanwhile, Germany stepped up the pace of the repatriation of its gold. In many countries personal investors are actively encouraged to hoard gold as a means of personal wealth storage and savings. Gold is an extremely scarce resource. If all the gold ever mined was refined into pure form and melted into a block it would be approximately 19m 3 , approximately 165,000 metric tonnes. Initially treasured for its colour, malleability and anti-corrosive properties, gold’s value is further enforced by its natural scarcity. According to research, the presence of copper in the earth’s crust is approximately 55 parts per million, when compared to gold’s 0.0038 parts per million, the natural scarcity this precious metal becomes even more clear. Disclaimer: We cannot offer personal investment or tax advice. This guide aims to offer a useful source of information and opinions to assist people in making their own informed decisions. If you do require detailed tax and investment advice, you should seek your own independent advice from an appropriately qualified adviser.